Legend Numismatics is by far the worlds leading expert on MS Seated Dollars. We exclusively built the #1 all time finest set ever. We have probably looked at EVERY MS64 and higher MS Seated that has hit the market. So we know how these coins should come. This coin is a no question “old time” GEM (before certification). We rank it as VERY HIGH END! For a big coin, overall the surfaces appear immaculate. Only if you use a strong glass on the right obverse side can you find a few old ticks. There is nothing that stands out or draws your eye. Not only does this coin offer some luster, it has the flash of semi-prooflike surfaces. Both sides are a gorgeous totally original mix of gold/pale pewter/champagne colors. There are NO spots or discolorations. Most important: Miss Liberty and the details are sharply struck. Even the head is pretty full. The eye appeal is great! PCGS 13, NGC 21, CAC 2. PCGS has graded only 5 higher. Good luck finding any in full MS65 that are CAC! 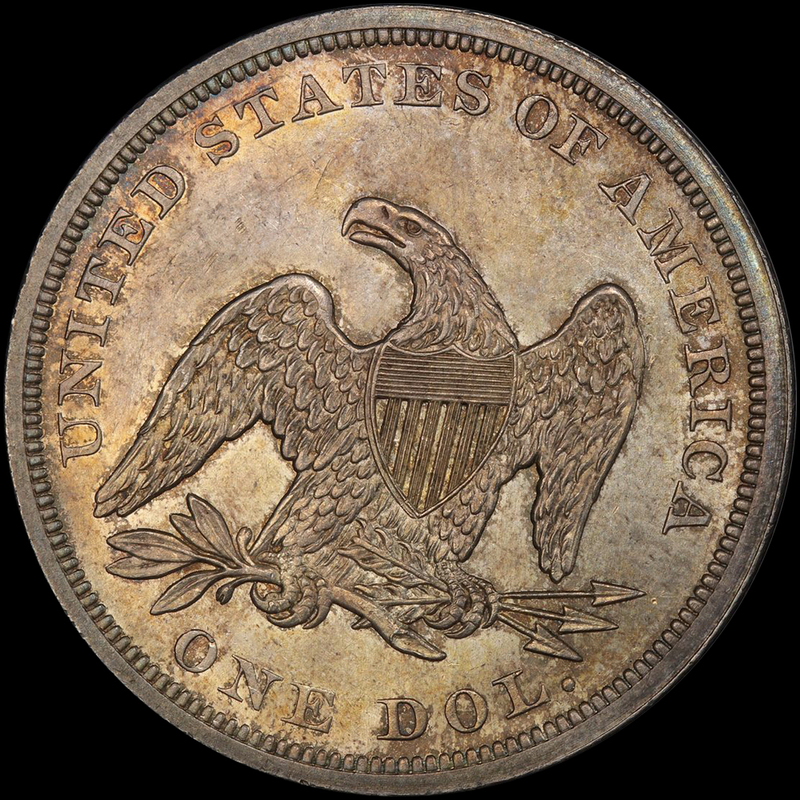 The last auction record for ANY PCGS selling is $12,925.00 back in 2014. It also should be noted a PCGS CAC MS64+ sold for $31,725.00 also in 2014. 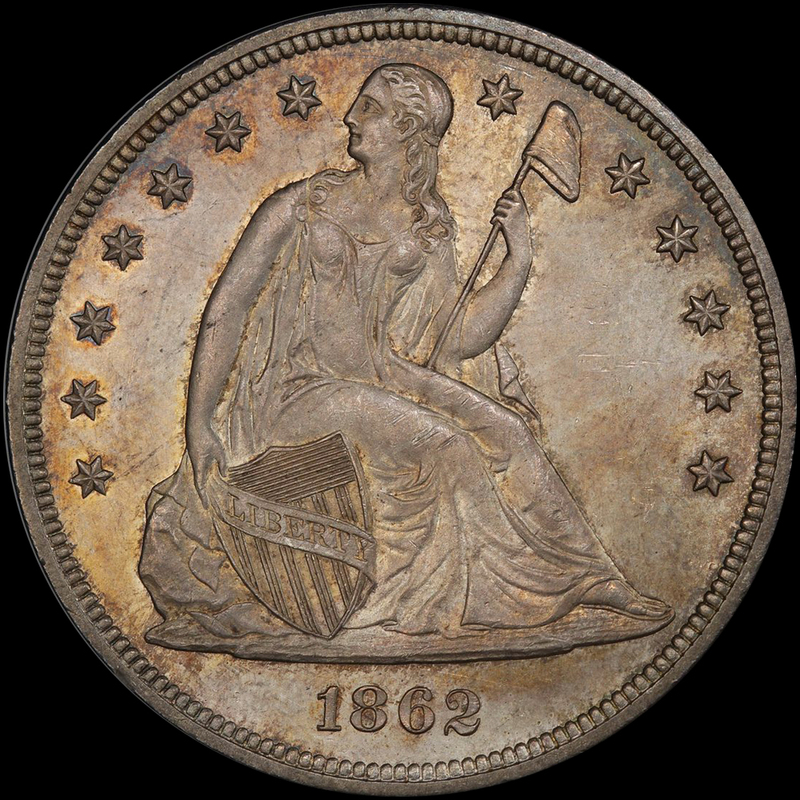 This coin will be a tremendous addition to any MS Seated set or Civil War set. It is really cool!